*Loans provided by EnerBank USA, Member FDIC, (1245 Brickyard Rd., Suite 600, Salt Lake City, UT 84106) on approved credit, for a limited time. Repayment term is 144 months. 1.99% fixed APR. Minimum loan amounts apply. The first monthly payment will be due 30 days after the loan closes. Same-As-Cash Loan – repayment terms vary from 24 to 132 months. Interest waived if repaid in 12 months. 17.09% fixed APR, effective as of November 1, 2018, subject to change. Interest starts accruing when the loan closes. Enerbank is the newest form of funding for solar systems today! Now you can invest in a lending company you can trust that is not like the others. 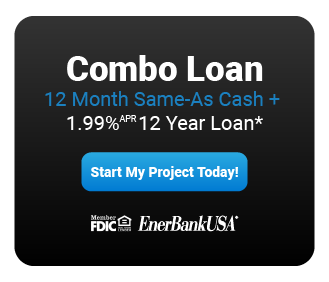 Enerbank is offering loans for 12 years with a 12 month Same as Cash option so you can have time to claim your Federal Tax Credit.